Solar Storms Causing Anxiety, Fatigue & Energy Shifts: December 17th, 18th & 19th. Home » Nature » Solar Storms Causing Anxiety, Fatigue & Energy Shifts: December 17th, 18th & 19th. A variety of things are known to affect the human body, mind, and spirit, including weather, temperature extremes, planetary activity, moon phases, altitudes, exposure to sunlight, and in particular, solar or geomagnetic storms. Just like all living organisms, the human physiology and psyche is constantly working hard to regulate and balance itself to align with its surrounding environment. Whenever anything out of the norm occurs, all living creatures are thrown out of sync and have to recalibrate their systems to regain “normality.” We see this when we observe how living things have moved through the stages of evolution. Right now, people may notice that their energy—and that of others around them—feels extra intense, like everyone is extra irritable, anxious, impatient, fatigued, nervous, spacey, or stressed. This may be due to the fact we are currently in the midst of powerful solar storms. Solar storms temporarily disturb the earth’s magnetosphere as solar winds and flares interact with Earth’s electromagnetic fields. Humans are also affected by this because we each have a personal electromagnetic field that surrounds us—an aura. Therefore, in the same way electromagnetic energy affects our planet, it may also play havoc with our own energy fields. Although we are somewhat protected by Earth’s magnetic field, the intense, highly charged energy is still believed to have a major affect on everything that exists on Earth. 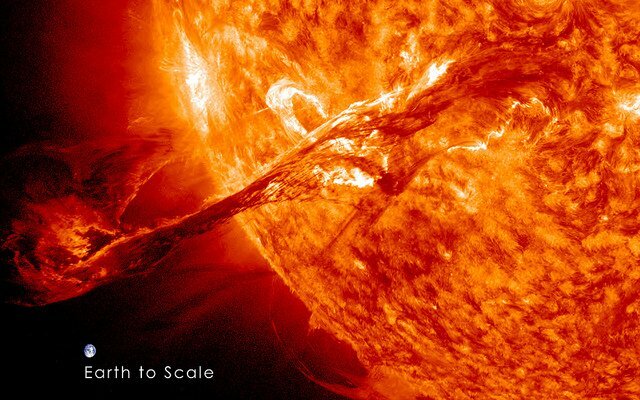 Solar storms can greatly impact anything from emotions to electrical devices. Solar storms are known to desynchronise our circadian rhythm, which is the internal biological clock that controls our sleep and wake times. Affected by this electromagnetic activity, our pineal glands produce an increase in melatonin—thus disturbing our sleep and throwing our intuition and inherent orientation out of sync. We suffer from disrupted sleep patterns, exhaustion, and vivid dreams. We may also have enhanced intuition and psychic awareness. When they occur, we can find ourselves spun out or agitated without having any clue as to why. We may also notice that our senses are on high alert, and that everything feels and sounds louder, brighter, stronger, and more vivid than before. Currently, there is a large, 200,000 km-wide canyon-shaped coronal hole that has opened up in the sun’s atmosphere, dividing almost the entire Earth-facing hemisphere of the sun. From this hole, a stream of high-speed solar winds (hot plasma) flows at a speed faster than 600 km/s toward Earth, and this highly charged wind will be buffeting the earth’s magnetic field over the next few days. This magnetic field is called the magnetosphere, and it is like a giant magnetic protective bubble that surrounds Earth. These storms are known to have a huge impact on radio communications, navigation/GPS systems, technology, and living organisms. Solar energy has been shown to change blood flow, boost adrenalin, and affect blood pressure. It also affects our sleep patterns, as mentioned previously. Research has found that geomagnetic storms can also have a huge effect on our emotional, mental, spiritual, and physical health. Peaks in increased anxiety, depression, bipolar disorder, fatigue, and nervousness have been found to coincide with solar activity. Many who already vibrate in the 4th dimension have been struggling with “one foot in a fairytale and the other in the abyss,” to quote Paulo Coelho. They have witnessed a vision of heaven on Earth—if we can all live and work peacefully and respectfully together—but these highly vibrating beings do not have the resources or manpower to manifest this vision on their own. They are tormented, stuck between turning away from the turbulence, and focusing on maintaining their own inner peace, or reaching out in whatever way they can to help and support those who feel lost or are vulnerable. Looking at the world we live in, it is clear that there is pain, agony, trauma, and destruction on almost every corner. But, what we often fail to see is there is also an immense amount of love, caring, and compassion too. We are all beginning understand how closely connected we all are, and that our world is not as fragmented as we might have thought. When we go through dark days on Earth, we grow together and band together as one in grief. When we go through light days, we vibrate higher and collectively move toward a higher frequency. The empathy and compassion we share for our brothers and sisters is the unconditional love that is required to raise the collective frequency and pull Earth’s energy up into the 4th dimension. Whichever way we look at it, whether we believe in prophecies, phenomena, and planetary and star alignment, or whether we just sense something undefinable could be happening due to the mega storms, fires, droughts, earthquakes, volcanoes, and solar flares, I think many of us would agree that it feels like we are currently going through something world-altering and momentous. There is great change. There is an end coming. It is the end of an old order that taught of separation, and made many believe that money, materialism, and superficial entities were highly valuable. The new ways teach of unconditional love, of universal acceptance, of higher energies that do not see division, and source energy that embraces and encompasses all. There will always be negative energies, or dark forces, on Earth. The entire universe consists of a mix of negative and positive energy. To vibrate higher and shift toward a higher dimension, we have to learn to yin and yang, and find balance and harmony, so that we find ways of co-existing as one, despite perceived differences. Ultimately, when we balance and heal our inner selves, the external world also benefits and transforms. We all share this earthly home, and we can all play a tremendous part in shifting our own vibration, as well as the Earth’s vibration, so that we are pulled upward to a higher frequency. This is done simply by practicing compassion, acceptance, unconditional love, and oneness, so that we generate and maintain bliss internally and externally. Solar wind streams cause auroras or northern lights to occur, so there is a high possibility they will be witnessed around the Arctic Circle over the next few days. 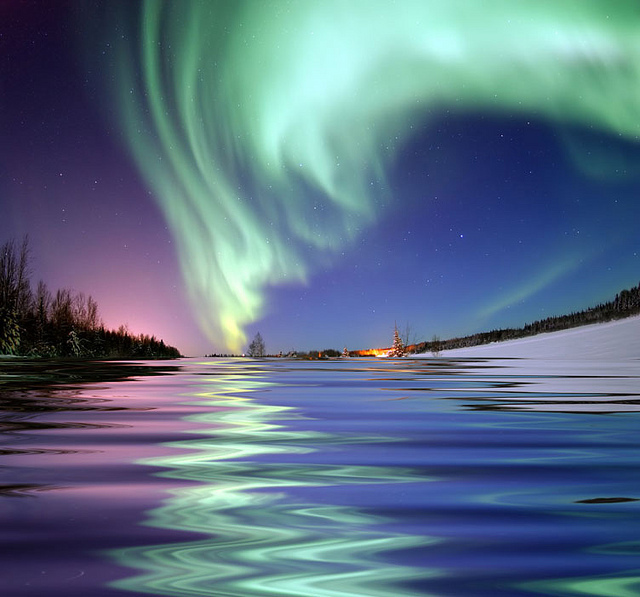 At this time of the year, even the gentlest gust of solar wind can spark a magnificent aurora show. Auroras or northern Lights will be clearly visible occur when particles cast out from the solar storm reach our planet’s magnetic field and then slam into atmospheric gases, triggering what is known as Aurora Borealis. They can usually be seen an hour before sunrise, or approximately an hour or two after sunset. Alex Myles is a qualified yoga and Tibetan meditation teacher, Reiki Master, spiritual coach and also the author of An Empath, a newly published book that explains various aspects of existing as a highly sensitive person. The book focuses on managing emotions, energy and relationships, particularly the toxic ones that many empaths are drawn into. Her greatest loves are books, poetry, writing and philosophy. She is a curious, inquisitive, deep thinking, intensely feeling, otherworldly intuitive being who lives for signs, synchronicities and serendipities. Inspired and influenced by Carl Jung, Nikola Tesla, Anaïs Nin and Paulo Coelho, she has a deep yearning to discover many of the answers that seem to have been hidden or forgotten in today’s world. To purchase Alex’s paperback book or ebook please click here or click here to connect with her on Facebook, or click here to join Alex’s Facebook group for empaths and highly sensitive people to connect.